If you want a wonderful, relaxing, getaway, THIS IS IT! It's 2.5 miles to the quaint town of Blowing Rock, but you will feel that you have a piece of Heaven all to yourself. The view is long range with mountains stretching into the distance from the large deck. You will want to spend all your time right there. Relaxing on the deck or sitting in front of the stone fireplace. The Fall Foliage is a view of beauty to behold from the property. Experiences in nature include relaxing in front of the outside fire pit overlooking the views and making smores with your family and friends. Bird watching and nature walks with your pets are fun pastimes. The amenities include wonderful, comfortable beds and full kitchen. The master bath has just been updated and features a jetted jacuzzi tub inside. The downstairs bathroom has also been updated with wood walls and nice new vanity. 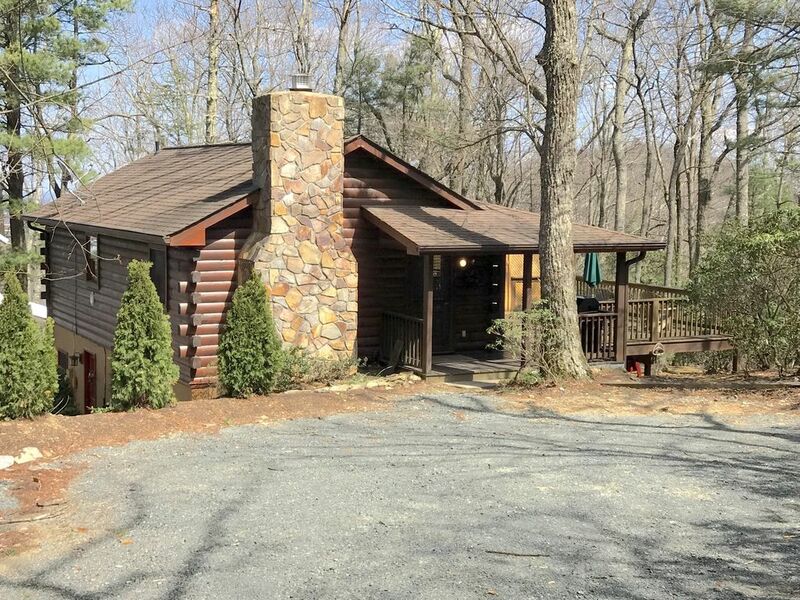 The outdoor features include great shopping areas nearby in the village and many many outdoor, nature activities including hiking trails nearby, and driving on the Blue Ridge Parkway towards Grandfather mountain via the Via Duct. We love living in Blowing Rock. We love hiking and motorcycling in these beautiful mountains. We have two dogs and three cats. You couldn't make us ever leave here. We have met many friends here from all over the world We know you will love it here also. We bought the vacation rental because we wanted to share this area with others. We care deeply that all who stay at the cabin have a wonderful, peaceful get away to enjoy. We personally oversee everything. The views from the deck are awesome. Especially in the spring and fall. It is very peaceful and there is a large yard with plenty of space to walk around the property. Very convenient , just 5 minutes to Blowing Rock. Long range views of mountains.Beautiful from the outside deck. Individual mini split air and heat units with remotes. Upper drive is completely renovated with parking for 2 to 3 cars. Ask owner for more details. Great DSL fast service and reliable. New leather small sofa and recliner. Additional fabric lounge chair. Island Dining area for 4 people plus a stool for a child. Outside dining for 6 people on the deck. New Smart TV in the living room, large TV in the master bedroom, and TV in the lower bedroom downstairs. Bose Blue tooth player available to stream personal music from your I Pad or Smart phone. Additional music available through the Smart TV. Long range views from deck. The deck is very large with comfortable chairs and dining area. WINTER SNOW ADVISORY ONLY Please note that you MUST HAVE FOUR WHEEL DRIVE to access the property during winter snow events. We DO have snow removal equipment and will plow the road as soon as possible. It is perfect during the warmer months. The road is black top with a gravel parking area and the access is easy. Please check out our winter weekly specials. Appalachian Ski Mountain is only 7 miles away! This cabin has incredible views and a great back porch. Everything was spotless. Cant wait to come back. The house was perfect for our needs, convenient to Blowing Rock, and has breathtaking views. We plan on going back. Cozy Cabin minutes from everything. We had a wonderful stay at this cozy and well appointed cabin while touring Appalachian State University. Would definitely stay again! This is a great property. Unfortunately there was quite a lot of fog for most of our trip, but on our last morning it cleared, and we were able to enjoy the spectacular view. Very close to Blowing Rock, Boone, and Appalachian Ski Mountain. There is a grocery store very close by. The cabin was clean and had everything that we needed for a weekend away with family. Rain prevented us from enjoying the fire pit, but we cannot wait to make some S'mores in it the next time we visit! We had 4 adults and 1 child (2 separate adults and 1 couple), so we did have to get a little bit creative with a bed for our daughter, but that was easily remedied with a pallet on the floor made up of all of the extra comfy blankets that were provided. She pretended she was camping! We will definitely be back. We have stayed at the Harris' places on several occasions and their homes and cabins are wonderful. They have an amazing view, are close to Blowing Rock and other attractions, and are very clean and comfortable. We always try to book one of their places when we head to the mountains! We love that we get to bring our beloved dog to enjoy the trip too! Always a perfect getaway! Deck W.Where do you live? Awesome cabin, great location and views are beautiful. Third year in a row. Great hosts. Thank you so much for staying with us again this year. We love having you as our guests! Fall Foliage. Close to the village of Blowing Rock within a 5 minute drive with outstanding restaurants and shopping. Close to hiking trails and scenic mountain drives including the Blue Ridge Parkway and Grandfather mountain.